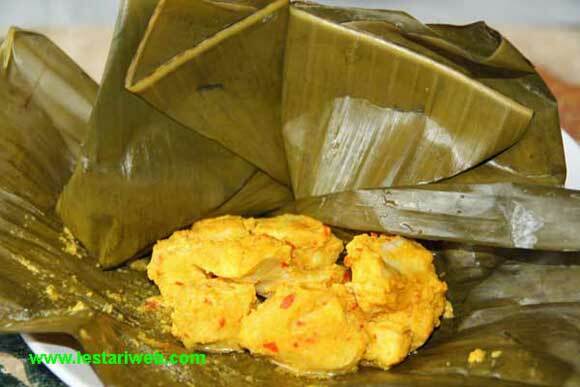 Here it is the special dish from Bali : Cakep Ayam or Chicken in Banana Leaf. It looks similarly to Pepes / Botok Ayam from Java. Botok is a steamed dish wrapped in banana leaves. The special spice which is commonly used in Balinese Kitchen is Lesser Galangale. Unfortunately the fresh rhyzome is rare almost impossible to find here in the west. But you can get the powder or dry rhyzome in Asian shop easily. Try your best to get it because this rhyzome could not be subtituted with other ingredient. Should be no Banana Leaf available arround you, then take Aluminium-Foil as a subtitude. 600 gr/1.3 lb Chicken Fillet, washed. Cut the chicken fillet in a dice shape ( 2x2 cm). Add the sliced chicken into the paste and mix well. Divide the above mixed chicken into 6 portions ( 2- 3 tbsp pro portion ). Put one portion in the middle of banana leaf, add bay leaf then wrap it properly. Secure the wrapping with tooth pick or stapler. Steam it for 30 minutes until the chicken well cooked. Fresh banana leaf is particularly stiff and easily torn when it is bent or fold. Therefore it is suggested to soften them before using. There are two ways in practice. Choose one which is easy & suitable for you. (1st). Soak the banana leaf in hot water about 3-5 minutes until the leaves are getting soft and change color slightly, then wipe it dry with a paper towel or a kitchen tissue to remove the dirt. (2nd). Wash and heat over the steam cooker or pass it over the flame of a gas stove or a hot electric burner.